Where industry and researchers meet, shaping the future and creating value. 2013 Helsinki, Finland, Finnish Maintenance Society, Promaint. 2012 University of Huddersfield, UK. 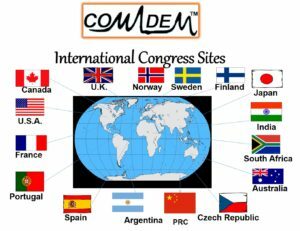 Since the first Congress and Exhibition in 1988, the Condition Monitoring and Diagnostic Engineering Management (COMADEM) International Congress has become probably the largest premier event of its kind in Europe, gaining momentum year by year. The aim of the congress is to promote awareness of the fast emerging interdisciplinary areas of Condition Monitoring and Diagnostic Engineering Management. COMADEM Congresses and Exhibitions are the ideal place to find out how to implement the latest tools and techniques in the multidisciplinary field of performance monitoring, root cause failure modes analysis, failure diagnosis, prognosis, and proactive management of industrial systems. Delegates will have ample opportunities to raise a number of current issues with many learned and experienced speakers representing both the industrial and university sectors.